Have you ever heard of the saying There’s no “I” in team? Well, Joseph Young sure has, and after being crowned the Pac-12 player of the year on Monday morning, the high-scoring guard out of Houston, Texas couldn’t believe that he won the most prestigious individual award in college basketball. However, Young reiterated that his achievement is not about him. The senior praised his teammates for the hard work and dedication they have shown this season. If you’ve been a rabid follower of the Pac-12 this season, then you know that the conference is full of talented basketball players. Whether it’s T.J. McConnell at Arizona, Delon Wright at Utah or Norman Powell at UCLA, it’s clear that there is no such thing as “off nights” in the Pac-12. However, there can only be one player of the year, and Young’s theatrics this season has propelled the Oregon Ducks on an improbable run. Young led the conference in scoring with 19.8 points per game, but he also did a lot more than just score the basketball. The senior also put up career high numbers in assists per game (3.7), rebounds per game (4.5) and minutes per game (36.4). 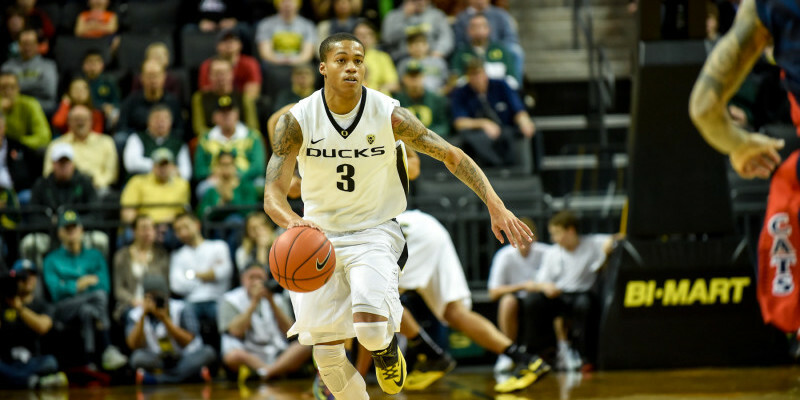 Joe Young’s leadership has been paramount to the Ducks’ success this season. Despite the fact he posted career numbers in various categories this year, Young admires the fact that he and his teammates never stopped believing in one another. The Ducks were projected to finish eighth in the Pac-12 conference before the season started, but the men in green and yellow pulled of the unthinkable. 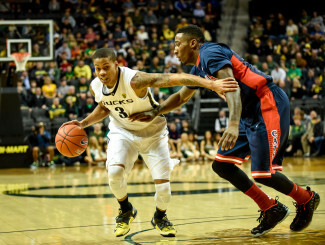 Oregon finished in a two-way tie with Utah for second place in the conference. After winning their last five ball games and finishing with a 23-8 (13-5 Pac-12) record, the Ducks have also put themselves in a position to make their third straight NCAA Tournament appearance. Oregon will play either Colorado or Oregon State in the semifinal round of the Pac-12 Tournament on Thursday night. It’s been a long journey for these high-flying Ducks, but Young believes that this team is special and he applauds the heart and the toughness that his teammates embody, as well.